This guide is a follow up to Basic Patterns That You Need To Know. 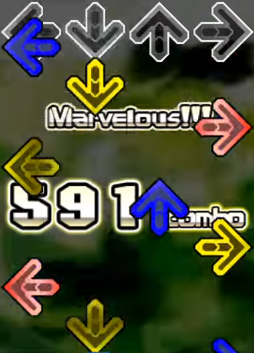 If you are reading this, you should already know how to read most of the common patterns found in DDR. Beyond that, there are some patterns that are found in the game that may take more than a few attempts to learn to read, let alone execute. The goal here is to walk you through identifying and how to perform those tough and confusing patterns. 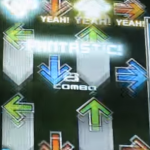 Though it was a fairly common technique in Pump It Up, hands were first introduced to the four-panel landscape with In The Groove. 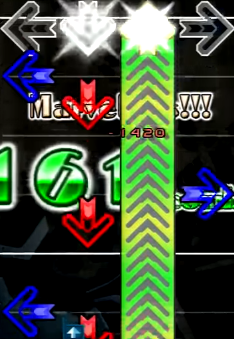 Hands require the player to hit three or four arrows at once, either starting with freezes and having the player bend down to hit the other arrows with their hand, or bend down to hit all of those arrows at once. Many In The Groove charts were written with the intention of having the player bend down for hands, but as player technique advances, it is possible to hit hands without bending down. 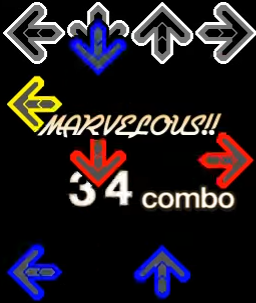 This can be done by what is called Bracketing, which is a technique where a player uses one foot to hit two arrows at once. The two arrows are separated by brackets that lock the arrow into place and that is where the foot tends to land, hence the name Bracketing. 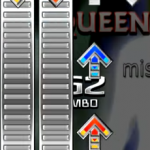 After r21 had been released for In The Groove, players began trying charts that were meant for keyboard on a dance pad. Those charts did not perfectly translate to a pad chart, however. 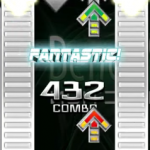 Bracketing was commonly used as a technique to conserve energy during stamina-intensive charts and to increase the chances of passing the song. Using that definition of bracketing today is scrutinized as illegitimate. Bracketing as an intentional technique in charts was later explored in Loaded Futurepack and to the extreme, V ~Rasen Style~. 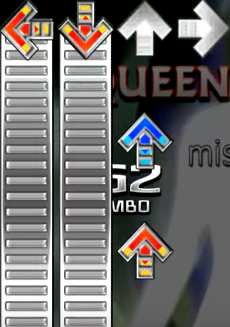 Use of bracketing in charts had died down for a while, but it had recently been revisited in charts like Festivo, PITAゴラス☆KISS, and Firestorm. 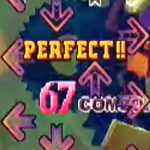 Due to some limitations in the game, DDR is not able to use hands or bracketing to the extent that Pump It Up or In The Groove can. 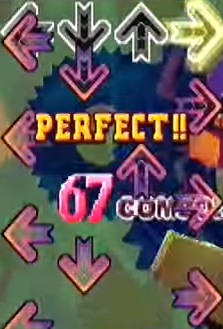 DDR is only able to go so far as to make the player hit two arrows with one foot as the more optimal solution over a normal jump. 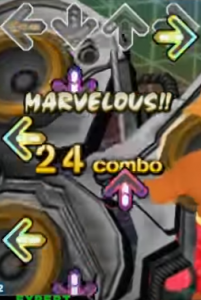 Charts like PARANOiA ~HADES~ Challenge and Joker Challenge have patterns where a player may be better off bracketing than using more energy to perform them as jumps. 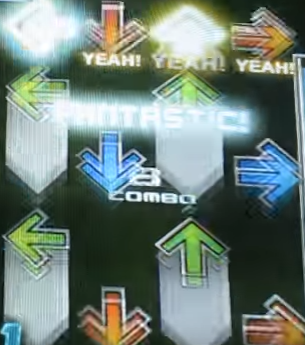 Although this pattern has been in DDR for a long time (CELEBRATE NITE [EURO TRANCE STYLE] as an example), it was very difficult to identify. It wasn’t until WinDEU’s edit to We Met Dat Night that foot-switches became a more commonly explored technique for charts (and in everyone’s favorite Nemeton chart) and they are still being used today. A foot-switch may look like just a two note jack into a double-step, but don’t be fooled! The two note jack is actually where you need to switch your feet. That is, when you hit the first note of the supposed jack, you switch to your other foot to hit the second note, and the rest should follow accordingly. It’s a tricky technique that will take a lot of practice. These are more like advanced crossovers that may require a bit more turning than normal crossovers. For example, common crossover patterns like the ones found in Can’t Stop Fallin’ In Love -Speed Mix- and Exotic Ethnic have players returning to their original positions, i.e. LDRDL. 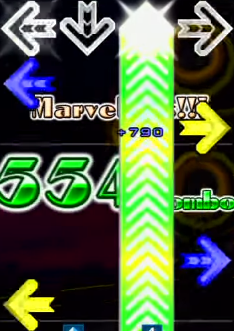 AFRONOVA makes the players step on the opposite arrow after a crossover, i.e. LURLDR. This pattern is also known as the “AFRONOVA Walk.” The player crosses over, and stays crossed over for the following pattern. For a visual demonstration, click on the image below. Nobody does half spins. 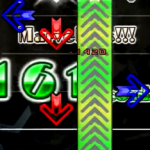 At least not players who are trying to keep their balance and timing. If you are one of the few who are able to keep good timing while facing away from the screen, then you deserve a medal. 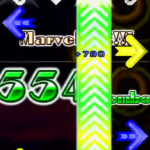 A half spin looks like a crossover that keeps on going until you face away from the screen, but you don’t spin around completely. 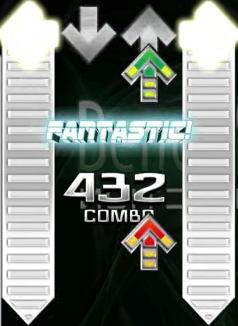 While it’s a neat technique to learn, players usually double step them to maintain balance and timing and they rarely appear in fast songs. 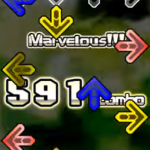 They were first introduced in DDR 2014 in 海神 EXPERT as pictured below, and the only other chart that this technique has been featured in is MAX. 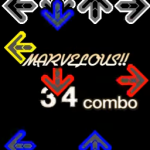 (period) CHALLENGE, so this is a very newly explored pattern as far as DDR goes. Similar patterns have been explored in In The Groove with rolls. At first glance they look like bracketing, but there’s actually a simple trick to them. In the case of 海神 EXPERT pictured below, the right foot is on the Up freeze, and the left foot follows a triple pattern starting with the 1/8th note and ends with the left foot on the Up freeze, then repeat the next triple pattern with the right foot. Simple, right? This is possible because there is a short, but lenient enough amount of time for when you are able to lift your foot off of the freeze before it breaks completely. In the example of MAX. (period) CHALLENGE, this can be done as a continuous 1/8th note run — L,D,U(freeze),R,D,U(freeze),L,D,U(freeze),R. Be careful to not let go of the freeze too soon. 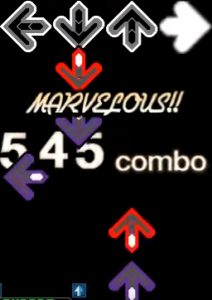 Next → Next post: The Very First Level 16 MFC!